It's my birthday on Saturday, something I share with Princess Anne, Napoleon, and my friends Julie and Val. 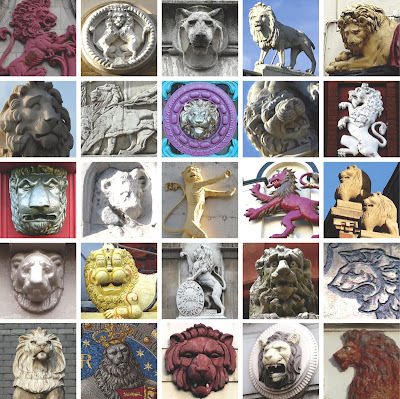 I don't really 'do' the star sign thing but I'll use any excuse to put a collection of London images together, so here are some Leos. There are some weird ones about. A lot of them appear ugly or confused when I think they were meant to look ferocious. Others look dim or fey. You might recognise a few of them. Here's my complete set. Happy almost-birthday, Jane! And I love your photo mosaics of my favorite city in the world! Apart from a couple, they don't really look as if they could rule the jungle, let alone the London jungle! What is it going to be next year? Images of the Virgin mary, August 15th being the Feast of the Assumption (and a bank holiday in Catholic countries) or something to celebrate the independence of India? In any case, congratulations for all your amazing posts and all the best on your birthday. ooh, some good ideas there Seb, I will bear them in mind. I am suffering today after having a fab party at my place yeaterday. Pimms is a very deceiving drink, well especially if one then moves on to red wine... ouch... you think I'd have learned by this this age! your pics are great. I have not so many words in english to write and to read. It would take too much time to try it, but I want to leave a little comment. Two weeks ago I have been to London - and I tried to took photos of it...and failed/flopped. I´m dissapointed and try it another time. I hope it wasn´t my last visit in London. I think it needs thousands of photos to get an idea what London is. Well... well done.